This inspired kitchen features cement-toned melamine cabinets with quartz countertop and mirrored backsplash. This Scandinavian kitchen cabinet creates a wood and stone ambience in your kitchen. Cabinet with selected melamine finish. All exposed surfaces in melamine, customisable to your choice of colours, with an internal frame in white melamine. All dimensions can be adjusted according to your floor plan. Cost will be adjusted accordingly. 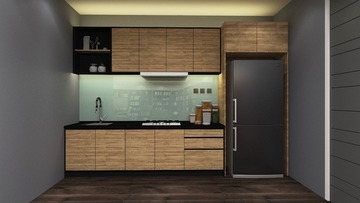 Note: Design includes carpentry work, and doesn't include the pendant lamp, electric appliances and decoration. For each lighting, there will be an additional charge of RM120. 1. I would like to order a kitchen and how does it work? 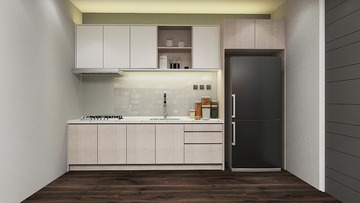 We will provide measurement and installation free of charge when you order a kitchen from us. 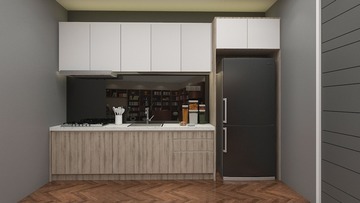 However, if you require customisation to the measurements or materials, or require creating 3D drawings, we will collect a 10% deposit upfront which is fully offset from the cost of the kitchen. 3. How do I make payment for my kitchen? 4. Do the kitchen come with a warranty? All our kitchen come with a 3-year structural warranty (e.g. manufacturing defects, product failure), but this does not include wear and tear (e.g. water damage, stains from chemicals, scratches or dents from impact). We also provide automatic insurance against property damages, theft and up to RM100,000 public liability insurance for the duration of the installation. 7. 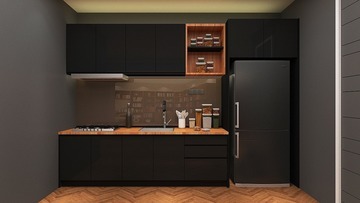 What materials are your kitchen made of? 10. I have an existing kitchen but I would like to dismantle it - can you help? 13. How do I take care of my kitchen such that it lasts a long time?